Well , I am on my 4th cup of tea under a fuzzy blanket still in my fuzzy pjs cause I am living on the frozen tundra in Saskatchewan , the mercury has fallen out of my thermometer . The good thing about it being so cold you can curl up with some fun books . Today we are going to review THE DOUBLE D RANCH by Rochelle Bradley . Much to the chagrin of foreman Josiah, Jessie Davidson wants a romance reduction. But the Double D Ranch hides a secret. Since inheriting the property, Jessie kept her grandmother’s hoard concealed, but now she’s found the courage to purge the unwanted items: steamy novels, thousands of them. Romance has to go! Donating the books is a good thing, right? Not when coupled with a dare. Will she shelve happily ever after like a rejected novel, or open her heart and start a new chapter? 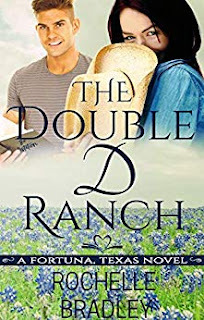 Welcome to THE DOUBLE D RANCH and the town of Fortuna Texas . Jessie Davidson has inherited the ranch from her grandmother . She has also discovered a hoard of steamy romance novels . When she donates them , she starts finding them all over town and a town caught up in the reading of said novels . Acting them out and just having romance all over the place . As her love life is idle , but there is a spark from a man that has been in her life will bring more then any romance novel can ever do . The characters were fun to read , there are some really wacky over the top characters in Fortuna Texas . Jessie and Josiah are such a cute couple even though they are just a little naïve about the whole love thing . They usually end up doing things on a dare . They are sweet and kind and you really want to get to know them . The person that kept me laughing hard was Desire, she is one hilarious woman, she loves to get people to do things that they normally don't do . Trust me ladies you will snort laughing at what these characters get up to . Thank you for reading the Double D Ranch. I'm glad you enjoyed it. My goal was to take the reader someplace new and make them giggle. Goal achieved. Desire appears in the next four books. She's such a fun character. Fortuna wouldn't be the same without her. Thanks for the kind words and the review.